Even after the flowers of Crocus nudiflorus have been damaged by poor weather, their beauty and variation can still be enjoyed. 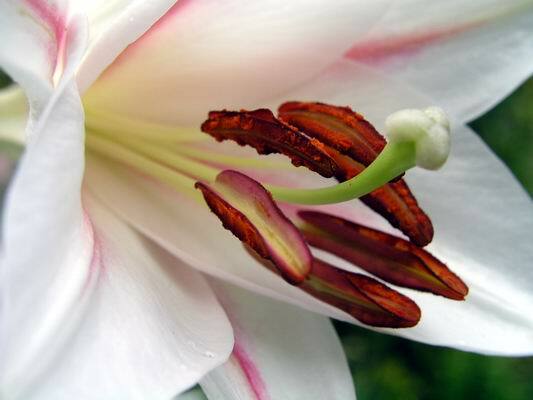 You can still see the difference in colour of the style and stamens, as well as the petals which also vary in shape. Here they are growing in a mesh basket plunged in sand, if you look carefully you will see from the shoots that many more have yet to flower. The trouble with Crocus nudiflorus is that it sends out stolons that do not respect the confines of the mesh basket and invade the entire bed. In the UK, Colchicum are often referred to as 'the Autumn Crocus' which is very confusing as it has nothing to do with the true crocus. 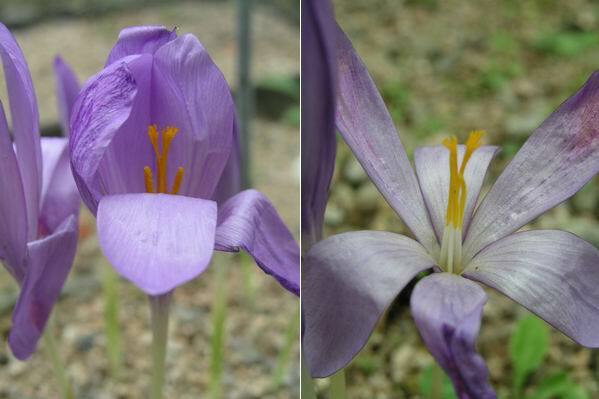 While superficially similar, Crocus are in the family of the Iridaceae and the colchicum are in the Lilaceae making them very different when looked at carefully. However they are commonly found growing together in both the wild and our gardens. 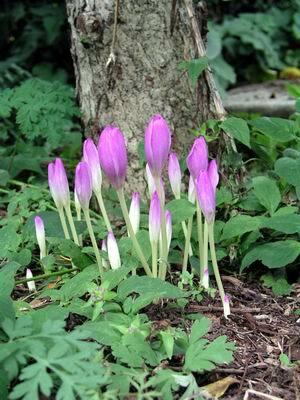 This picture of a colchicum 'bulb' shows just how it grows. The flower rises from the side and the base of the 'bulb' and you can see the roots just starting to appear at the base of this stem - this is where next years 'bulb', will form. 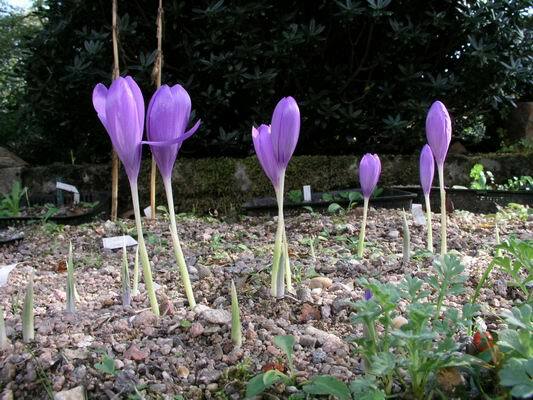 For simplicity we all tend to use the term 'bulb' to include all swollen underground structures; colchicums are believed to be corms. 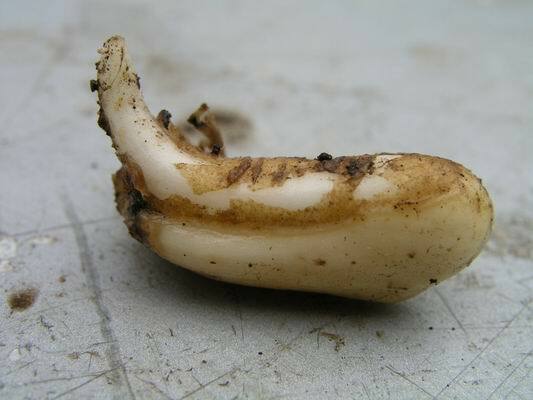 The truth is that while some of these structures are clearly bulbs - modified swollen leaves, corms - swollen stems, or tubers - swollen roots, many others are difficult to identify and may fall between a bulb and a corm or even display characteristics of both and are, like so much taxonomy, the subject of much debate. Whatever, these swollen structures - bulbs - make a fascinating subject for study on their own even if they never produced a flower. 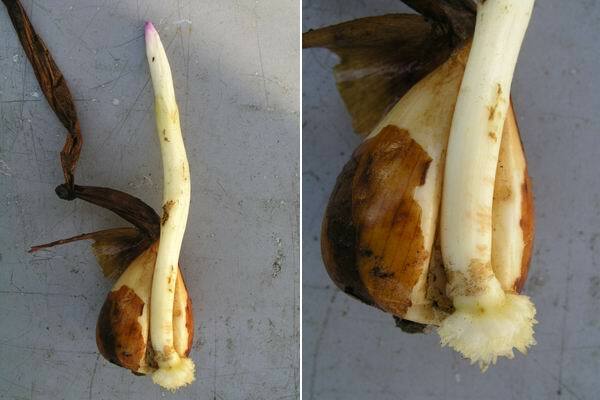 This young Erythronium 'bulb' looks very like the colchicum corm in structure, you can clearly see the shoot starting to form from the base and side of the swollen storage structure but some will say it is a bulb and some a corm; I am confused. That is why I will use the simple term of bulb in the log to refer to all of these complex structures. If like me you want to study and learn more about bulbs clues are to be found all around, even in the supermarket. 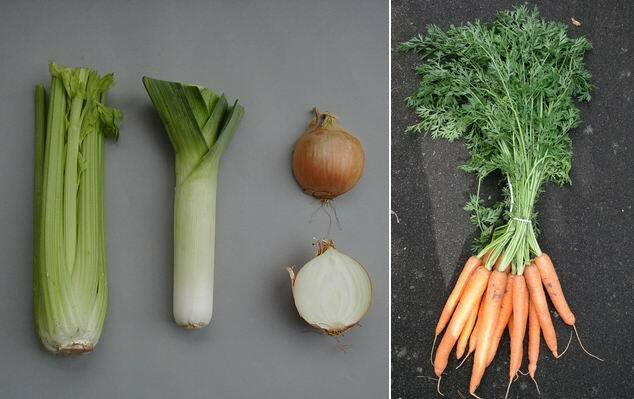 Bulbs in various stages of their evolution can be found in celery, leek and onion - and then there are carrots - it makes the weekly shop much more interesting. 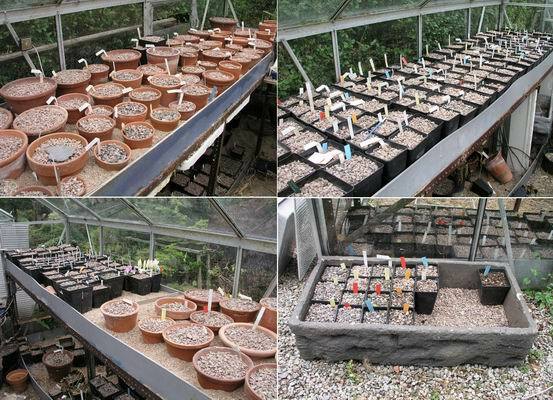 Having got that out of my system for just now, these are corydalis bulbs that we are re-potting and splitting. 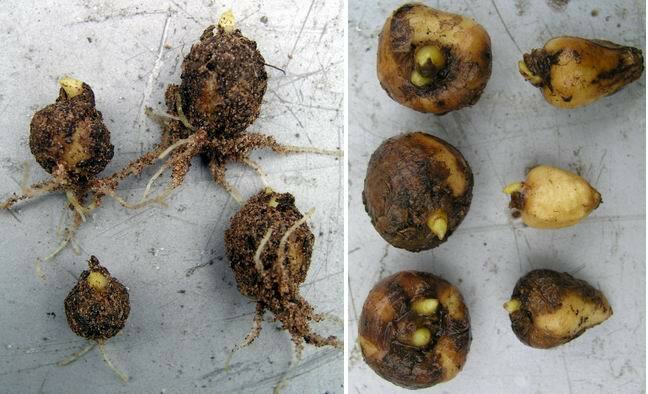 On the left is C. malkensis showing that the roots and shoots are already well developed and the shoots of C. solida (right) push up before the roots have started. 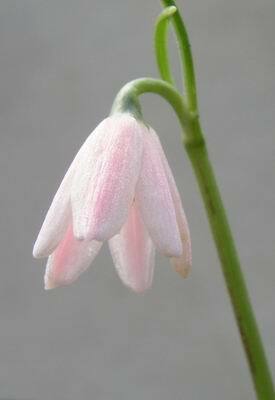 The C. solida bulbs that have two shoots will produce two bulbs next year. Previously on the log I have shown the technique of chipping Narcissus bulbs and here is an updated picture showing, on the left, how they are after one year's growth. 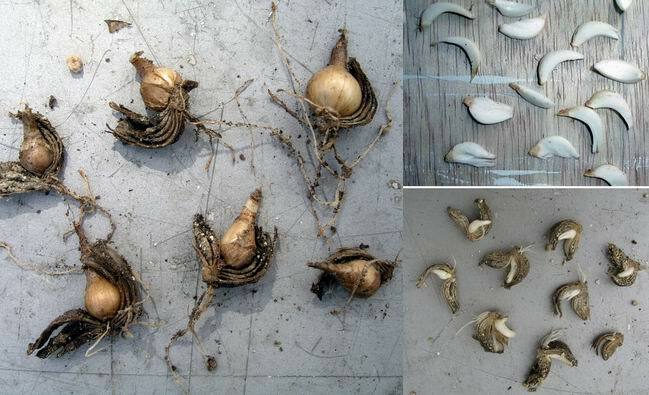 The remains of the old scales have dried out and should now be removed from the young bulbs. On the right, above, are last year's newly cut up scales and, below them, are the same cuttings six weeks on, showing the tiny bulbs forming. While we are still busy doing the last of the re-potting I am also making preparations for the first watering by placing the pots in the glasshouses. Some plunges will be all clay pots, some are all plastic pots and one is a mixture of both. I do find myself drifting to all plastic pots as they make much more efficient use of the space we have. 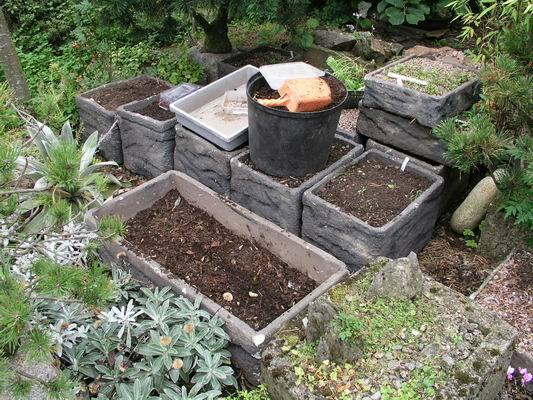 Polystyrene fish box troughs are ideally suited to accommodating square plastic pots and we now grow many bulbs that do not require so much protection such as Corydalis, Crocus and Erythroniums in this way. We also use the fish boxes to grow erythroniums and corydalis in bulk. Here are a group that we have been replanting this week; the deep ones are ideally suited to erythroniums. The first flower on this tiny Leucojum roseum has opened and when there is just one it makes you look at how beautiful it is. When the others come out and you have a potful, it is the overall effect that takes your eye. At the other end of the size scale is this massive hybrid lily with flowers 20cms across and a lovely scent. Which would I rather have? I want them both.